The functions and properties of a synapse localized on a dendritic spine are probably largely dependent and directly controlled by the shape, structure, and molecular composition of the spine itself, and also the number and shape of dendritic spines are controlled by synaptic activity. One finding that supports the importance of spine shape and number in cognitive functions is the fact that both parameters are altered in various genetic diseases involving mental retardation, although it is not clear whether this is a consequence or the cause of the diseases themselves1. It is therefore fundamental to understand how spine shape and structure are regulated and controlled. 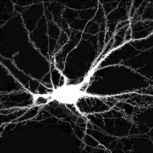 Dendritic spines essentially consist of a head and neck attached to the dendritic membrane. 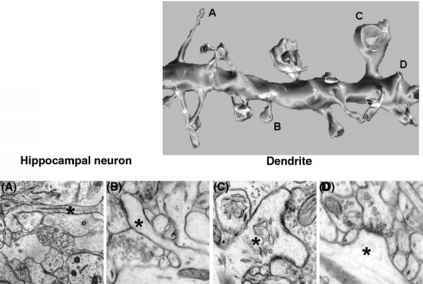 Extensive electron and light microscopy studies of brain tissue have shown that dendritic spines have multiform shapes that are classified as thin, stubby, or mushroom shape (Figure 18.1), all of which can be found simultaneously on the same dendrites2,3. The classic and most representative mushroom-shaped spines have a large head and narrow neck, whereas thin spines have a smaller head; stubby spines show no obvious constriction between the head and its attachment to the dendritic shaft (Figure 18.1). However, the static microscopic view of spine shapes only partially reflects the real in vivo situation because, at least in developing neurons, the shape of about 50% of the spines changes over periods of minutes or hours4. Spine motility and modifications are developmentally regulated and, in mature neurons, there are fewer transitions between categories and the number of stable spines increases5. Mature spines usually make contact with one or two excitatory presynaptic terminals located at the head and, essentially, a dendritic spine represents the main unitary postsynaptic compartment for excitatory input. Immature spines are often very long and have filopodia-like shape. At later stages of neuronal contact development, their mean length decreases and the number of filopodia is greatly reduced. During the maturation process there is an increase in spine density, a decrease in overall length, and a decrease in the number of dendritic filopodia. Recent studies showed that filopodia rapidly protrude and retract from dendrites, especially during the early stages of synaptogenesis6, and thus, it is widely believed that dendritic filopodia are the precursors of dendritic spines, although how the transition from filopodia to spines occur has not been completely clarified. Remarkable differences have been observed in the intracellular composition of each spine, which consists of the PSD organelle facing the presynaptic button and the cytoskeletal structure consisting mainly of F-actin. About 50% of the spines on hippocampal CA1 cells and virtually all spines on Purkinje cells also have a smooth endoplasmic reticulum (SER)7. Some of the dendritic spines of pyramidal neurons contain the spine apparatus, an organelle consisting of two or more disks of SER separated by an electron-dense material. Large spines usually have a morphologically and functionally large synapse, and often contain an SER and spine apparatus, organelles that are formally absent in small spines7. As the SER plays a role in Ca2+ handling, the regulation of spine size may be critical for controlling calcium homeostasis. It has recently been demonstrated that the NMDA receptor-dependent increase in spine Ca2+ is less in large spines (which have a large neck that permits a greater efflux of Ca2+ into the dendritic shaft) and more in small spines that have a smaller neck. Spine-neck geometry may govern the ability of small spines to be preferential sites for the isolated induction of long-term potentiation (LTP)8. 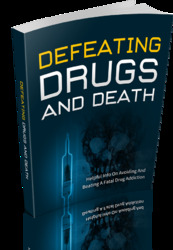 Other important components are the polyribosomes, which are in a close relationship with each spine and in which proteins can be specifically synthesized. 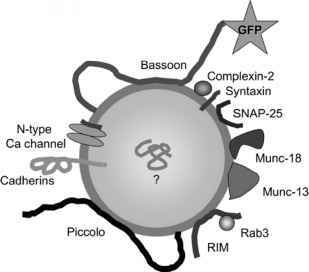 They are frequently found in the spines of different neuron subtypes, where they relocate after LTP9. The spine PSD occupies about 10% of the surface area exactly opposite the presynaptic active zone. The PSD and spine volume are also proportional to the area of the active zone, which is proportional to the number of docked vesicles10, and the number of docked vesicles in turn correlates with the amount of neurotransmitter release per action potential. All of these data suggest that large spines represent stronger synapses for both pre- and postsynaptic properties, and that the growth of the spine head during development probably correlates with reinforced synaptic transmission10. The shape of the PSD is not fixed, but may change with alterations in the strength of synaptic activity, such as those occurring during LTP, and this may reflect enhanced AMPA receptor insertion into the postsynaptic membrane (as an early phase of synapse duplication and spine division)11. Overexpression of the AMPA GluR2 subunit induces spine formation in hippocampal neurons, an effect that depends on the subunit's N-terminal domain (NTD) and not on receptor channel properties. These data suggest that GluR2 plays a structural role in spine formation12. Figure 18.1. The Different Dendritic Spine Structures and Morphologies. Dendritic spine morphology can be observed in a hippocampal neuron transfected with GFP as shown in the top left panel. A more detailed analysis of spine shape has been observed by a 3D reconstruction of serial electron microscopy (EM) images as shown in the top right panel. In panels A-C are represented examples of different dendritic spine shapes viewed at EM level (spines labeled with asterisks). Similar images have been used for the 3D reconstruction. EM and 3D-recontruction images were adapted from: Synapse Web, Atlas of Ultrastructural Neurocytology Josef Spacek MUDr DrSc, John C. Fiala PhD, Kristen M. Harris PhD, Funded by the Human Brain Project, NIH grant R01 MH/DA 57351, http://synapses.mcg.edu; and from Fiala, J. C., Spacek, J., and Harris, K. M. (2002) Brain Res Brain Res Rev 39, 29-54, with permission from Elsevier.